Saquon’s World Penn State legend and current NFL Rookie of the Year revealed that he was nearly given a different name at birth . 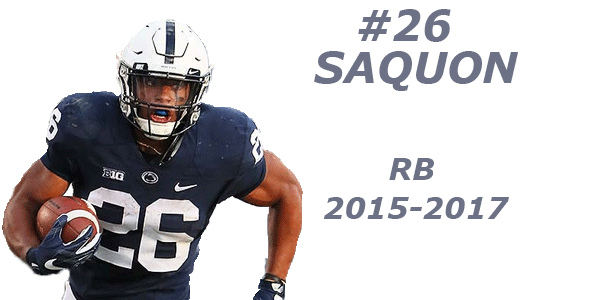 I’m glad they went with Saquon, since he can now be known purely on a first name-only basis as his legend continues to grow. Plus, “SAQUON, SAY GONE!” sounds better than “TUPAC TOO FAST!” on his customary breakaway touchdown runs. Saquon also revealed he’ll be holding a football camp this spring , that is open to both girls and boys. Simply the Best It’s safe to say Cael Sanderson knows how to spot and develop elite wrestlers, as proven by winning eight national championships in the last nine years. One of the most foremost traits he looks for? Finding student-athletes that absolutely want to be the best. If they’re willing to put in the work, Sanderson will get them there. Ricky’s Realm Ricky Rahne gave a wide-ranging interview where he discussed key position battles, how to fix the drops that plagued the receiving corps last season, how he’s progressed as an offensive coordinator after his first season on the job, and much more insight on the state of the offense as the 2019 looms. New Beginnings Zech McPhearson announced his landing spot after departing Penn State earlier in the year. Keep an eye out for him in the Texas Tech secondary this fall, where he will still be wearing #14 as he did as a Nittany Lion. Here’s wishing him all the best, as he is sure to become a major asset for the Red Raiders defense. Speaking of jersey numbers, Mike Gesicki will also be wearing his former number from Penn State as he switched from #86 to #88 with the Dolphins . Stickin’ with Ficken Penn State folk hero Sam Ficken is getting another shot at the NFL , and will hope to earn a roster spot in Green Bay this fall. He’ll look to replace Mason Crosby, who has had an excellent career but encountered struggles in 2018. This Again? According to the pundits, Michigan is a heavy favorite to reach the College Football Playoffs in 2019. Sure, they have talent and have, at times, looked like a playoff-caliber team…but it seems to be the same old story every year. Either disappoint early and often, or the Wolverines look like one of the best teams in the nation before collapsing late in the season.